This entry was posted in Uncategorized on March 31, 2015 by leahshafer. This is the fifth provocation for the event, Participatory Pedagogy, to be held at SCMS 2015. Shelleen Greene, University of Wisconsin-Milwaukee and Nina Bradley, Northwestern University look at the issue of authorship, specifically with regard to how race frames or reframes the debate. The event is a collaborative effort of the SCMS Women’s Caucus, Media Literacy and Pedagogy SIG, the Queer Caucus, and the Women and Screen History SIG. This series of five videos contributed for our event is designed to help initiate a discussion on film and media courses that integrate media, technology, praxis, and/or activism. Authorship from DJ Zoe Trop on Vimeo. This entry was posted in Uncategorized on March 19, 2015 by vacall. Representation from DJ Zoe Trop on Vimeo. This entry was posted in Uncategorized on March 9, 2015 by vacall. What is the Participatory Pedagogy event? 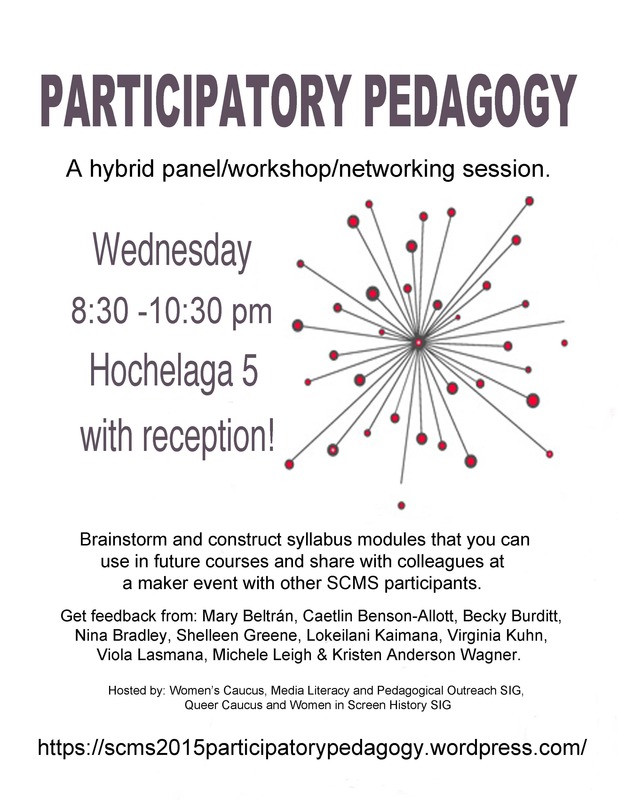 The proposed event is a collaborative pedagogy construction event, designed as a hybrid panel/workshop/networking session that invites participants to crowdsource strategies, tools, and resources for a film and media course that integrates media, technology, praxis, and/or activism. The event is designed to open space at the conference for scholar/pedagogues to work together, to think broadly about course content and design, and to create flexible and provocative course modules that will be shared with the broader SCMS community. We feel the conference is an ideal space for incubating pedagogies that connect theory to praxis and ethics/politics to teaching. At the event, participants will work in groups to create course modules (e.g. course units) based on prompts offered by consulting panelists. The groups will have twenty minutes to collaboratively construct a course module. After the modules have been created, the panelists (composed of dyads of senior scholars and graduate students) will provide feedback. The syllabus will then be given a creative commons license and offered online for anyone to use. The event will provide a space at the conference for hands-on creative teamwork. It will model inter-generational collaboration and it will produce materially useful, spreadable teaching units. This event will provide theoretical, creative, and practical pedagogical strategies for those interested in further integrating technology, social change, media activism, and/or praxis into their teaching. It will benefit SCMS members from a number of fields and perspectives by being broad and wide-ranging and at the same time concrete and practical. The event will allow SCMS members to leverage collective knowledge and to harness the opportunities for cross-cultural, asynchronous sharing provided by digital spaces. It will provide a tangible record of the pedagogical practices of a diverse range of SCMS members and it will promote the kind of collaborative, non-hierarchical ethos embraced by the Women’s Caucus, the Media Literacy and Pedagogical Outreach SIG, the Queer Caucus, and the Women in Screen History SIG. The event will encourage participants to share knowledge about the ways they are teaching (with) media in our quickly changing media landscape. It will be a new and unique event: a check-in for media educators looking to connect with each other in the age of participatory digital media culture. We hope to learn from each other about what kinds of media practices our students are involved in and comfortable with in the classroom, thereby enriching SCMS’s offerings with regards to media pedagogy support. This entry was posted in Uncategorized on March 3, 2015 by leahshafer. Feminist Media Literacy from DJ Zoe Trop on Vimeo. This entry was posted in Uncategorized on March 2, 2015 by vacall. Here’s the second video in our Participatory Pedagogy event for SCMS 2015. Thanks to Kristen Anderson Wagner Menlo College), and Michele Leigh (Southern Illinois University Carbondale) for their contribution to framing a discussion of teaching Archives. Archives from DJ Zoe Trop on Vimeo. This entry was posted in Uncategorized on February 25, 2015 by vacall.